The Lord keepeth all their bones, not one of them shall be broken (Ps.33). In the year 1993 from the Nativity in the Flesh of God the Word, on the feast of St. Chariton the Confessor, September 29/October 11, the All- merciful Lord revealed to us sinners the greatest mercy through the uncovering of the holy and much-healing relics of the Hierarch and Wonderworker John, Archbishop of Shanghai and San Francisco who rests in the beautifully embellished and prayer-filled sepulchre, untouched for twenty-seven years after burial, under the Cathedral of the Most Holy Mother of God, Joy of All Who Sorrow. 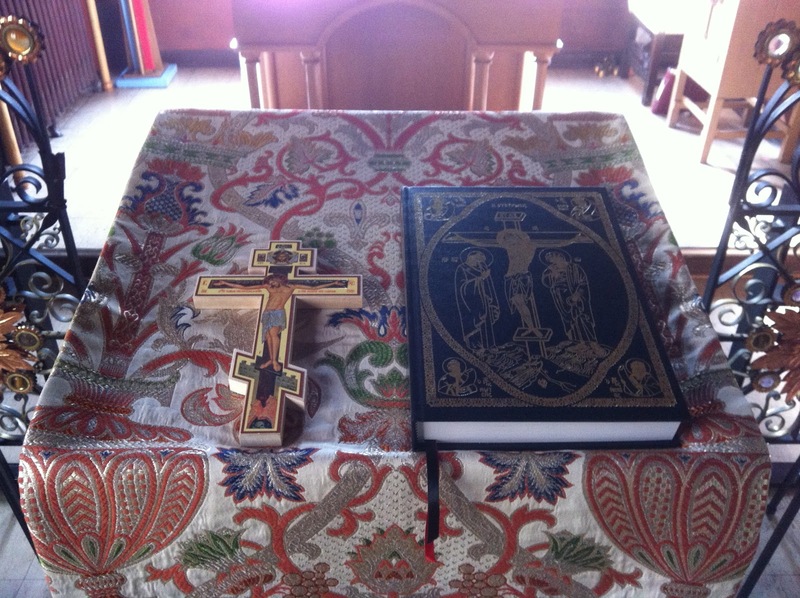 Monday was a strict fast day for all those who took part in this holy obedience to the Church. 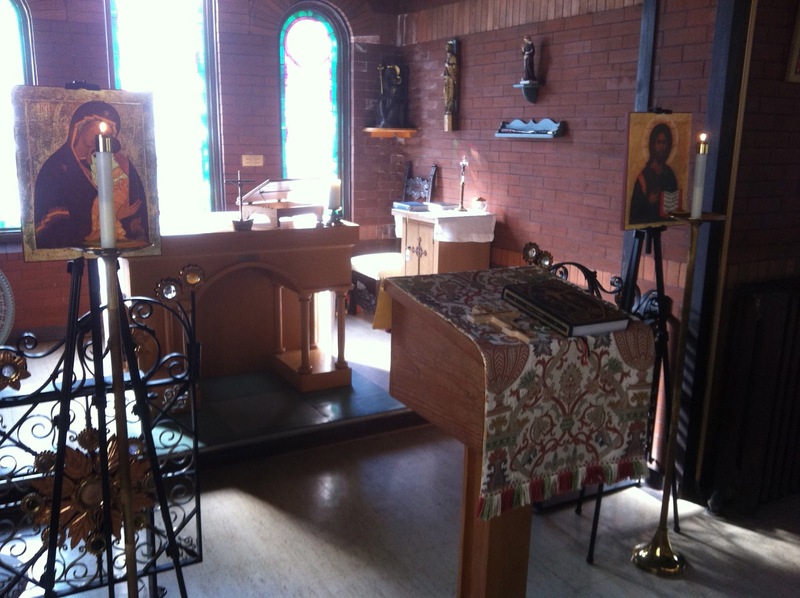 Many prepared by serving the Divine Liturgy and through Confession. In the evening, after Vespers was served at the altar of our Holy Father John of Kronstadt, Wonderworker of all Russia, in whose canonization the ever-memorable Vladyka John took part, a blessing was taken from the ruling Archbishop Anthony around eight o'clock in the evening by Priest George Kurtov, Priest Alexander Krassovsky, Protodeacon Nikolai Porshnikoff, Deacon Alexei Kotar, and Reader Vladimir Krassovsky. After the blessing these participants entered the holy sepulchre in order to make the necessary preparations which earlier had been blessed by His Grace, the ruling Archbishop. In the sepulchre the caretaker, Boris Michailovich Troyan, was already working and waiting. A long table was prepared on which was later placed the new, temporary, pine casket. Crowbars, hammers and other instruments were brought in. All candle stands, analoys, and flowers were placed aside to make more room for the work. Candles were burning on the candle stands and the entire sepulchre was fully illumined. After the initial preparation work was completed, and after the exclamation "Blessed is our God," and the beginning prayers, they began to read the Gospel from St. John over the casket, In the beginning was the Word. Around nine o'clock in the evening during the reading of the Holy Gospel, the ruling bishop of Western America, Vladyka Archbishop Anthony, Archbishop Laurus of Syracuse and Holy Trinity, Bishop Kyrill of Seattle, Archpriest Stephan Pavlenko, Archpriest Peter Perekrestov, Priest Sergey Kotar, Hieromonk Peter (Loukianoff), Priest Paul Iwaszewicz and Hierodeacon Andronik (Taratuchin) arrived at the holy sepulchre. All together there were fifteen people: three hierarchs, seven priests, three deacons, one reader, and one layman. All three bishops, as well as all the priests, read from the Holy Gospel. Around 9:07, after the Gospel readings, the bishops began to serve a full Pannykhida which was sung by the clergy. This ended around 9:45 P.M. Before the chanting of Memory Eternal the "Prayer Before the Beginning of Every Good Work" was read. 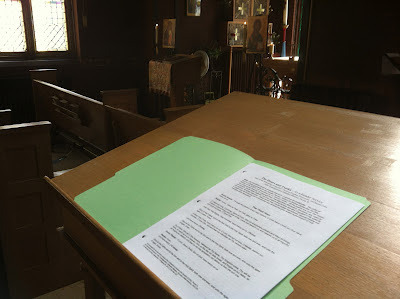 Vladyka then turned to all those present with the following words, "Honored Vladykas, Fathers, and Brethren; the Lord has sent us in holy obedience to our Church in order to examine and report concerning the honorable remains of our good instructor, Archbishop and father, Vladyka John. Let us approach this holy work with love for one another... with one mouth and one heart." Vladyka Anthony then asked forgiveness of all present, then made a prostration, which was repeated by all with the words, "God forgive you and us. 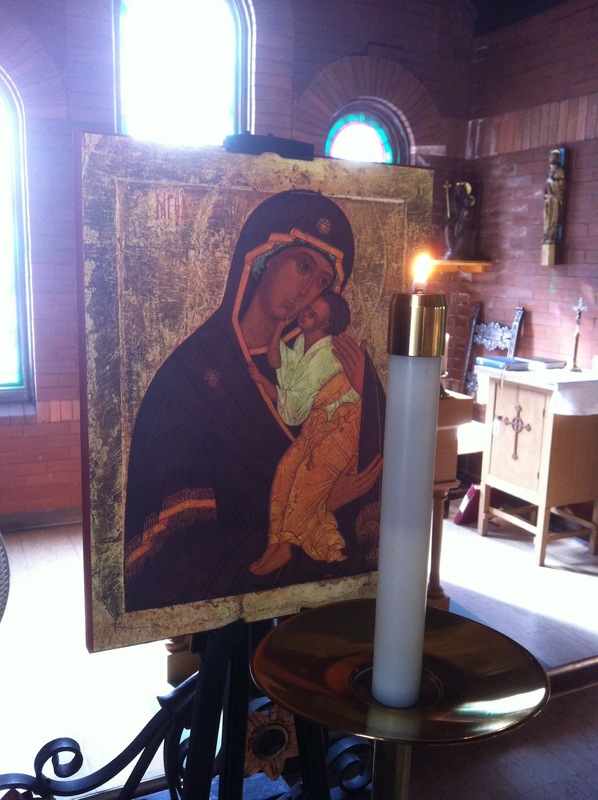 Pray for us, Holy Vladyka." The Protodeacon then intoned "Memory Eternal." The new, temporary, pine casket was then brought in. The inside of the casket was lined with satin. On top of the casket was fixed a Cross. Inside the casket was placed a new, white sheet. The casket was blessed with a prayer. All of the sacred objects and the brocade were taken off the holy sarcophagus. An explanation was made to all those present concerning the former investigation which had taken place during the night of September 17/30, the commemoration of the Holy Martyrs Faith, Hope, Love, and Wisdom. We then proceeded to remove the cement lid from the sarcophagus which weighed around four hundred pounds. This took place during the compunctionate singing by all of the troparion, "Have mercy on us, O Lord, have mercy on us." The lid was taken into the corridor outside of the sepulchre. All those who had not been present at the initial investigation now saw that the mantle which covered the casket was like new. Taking into consideration that the initial examination had shown that the casket was severely rusted, all present proceeded to tie the casket in four places because it was not known what condition the bottom was in. During the singing of the ekos "Thou alone art immortal," the holy casket with the remains of Vladyka John was very carefully raised from out of the sarcophagus. It was initially raised higher in order to examine the underside. Then boards were placed underneath, and the casket was placed on the sarcophagus. During the examination of the casket, it was noticed that the casket had severely decomposed, and in many spots rust had eaten through. The casket which was a silver-gray color at the burial was now golden, due to the tarnished lacquer coloring. 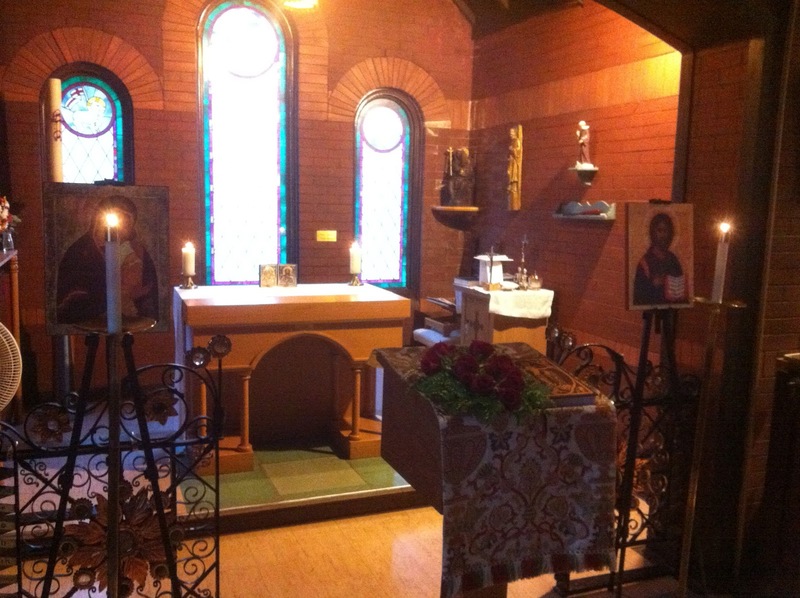 Vladyka Anthony then blessed Hieromonk Peter (Loukianoff) of Holy Trinity Monastery to open the casket. After the casket was closed at the burial, Fr. Peter had kept the key during these past years in memory of Vladyka John. After a few attempts had been made to open the lid of the casket, it became apparent that the lock had rusted through. In spite of all careful attempts the lock would not open. The lock was finally broken by the Protodeacon's earnest prying. It was necessary to use crowbars, screwdrivers, and pliers to separate the lid. The casket began to break up and fall apart in front of our very eyes. Calling to aid the Most Holy Mother of God, we sang "We have no other help, we have no other hope but thee, O Sovereign Lady..." Finally, after approximately ten minutes of work, the lid was separated from the casket. It is difficult to describe in words that trembling state which overcame all of us. Vladyka Anthony lifted the half lid at the upper end of the coffin during the singing of, "The door of compassion open to us, O blessed Theotokos," and the holy relics of Vladyka John were revealed to us. The most devout feeling of peace and quiet reigned. Those present clearly saw the outline of the reposed bishop's form vested in brocade Paschal vestments which, due to dampness and humidity, had turned a greenish color. On Vladyka's head was a white miter with hand-painted icons. Vladyka's face was covered with a white chalice cover embellished with painted Seraphims. Under his right hand there lay a wooden staff. The remains were sprinkled with a considerable amount of earth. The author of these lines who at the time of the burial served as a staff-bearer for the ever-memorable Savva, Bishop of Edmonton, recalls that before the closing of the casket His Grace, Vladyka Savva, sprinkled earth over Vladyka John out of a rather large container. At the same time another bishop, the ever-memorable Vladyka Leonty of Chile, poured oil from the Service of Unction on the body. The dry, incorrupt hands of Vladyka John were raised slightly in the air since the lower part of the torso had sunk in. We could see skin and nails. The prayer rope on his left hand had decayed. The wooden cross from Jerusalem on which was glued a paper icon, as well as the "Prayer of Absolution" were still preserved in Vladyka's hands. His Cross and Panaghia also remained. A small gospel book from Kiev, bound in leather, was still intact despite the fact that the inner binding had disintegrated and fallen apart. There was another Cross in the casket by the left shoulder which fell apart when examined. 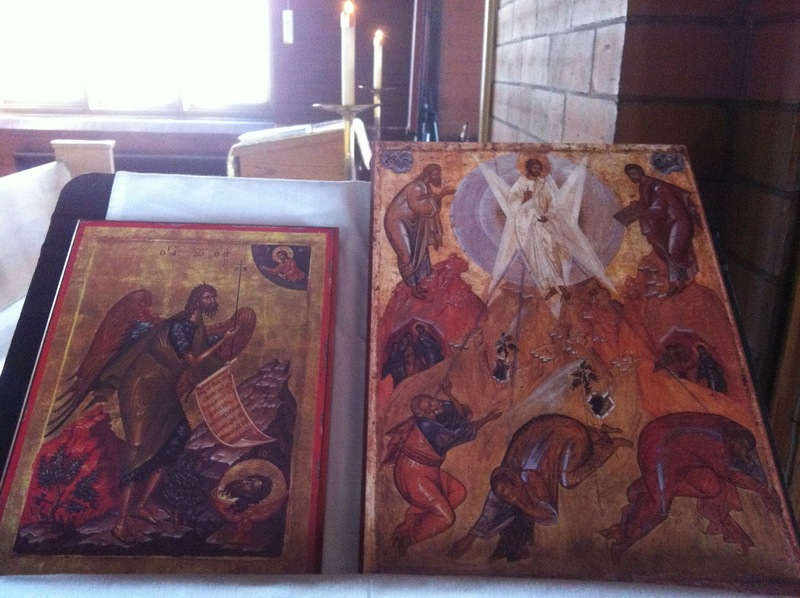 A small icon of the Holy Archangel Michael (Vladyka's patron in the world) had almost entirely disintegrated. All of these holy objects were then taken out of the casket and put aside. It was known that at the burial the material lining the inside of the casket was a light blue; now, due to mold and dampness, it had turned green. Vladyka Anthony crossed himself and while reading aloud the fiftieth psalm, "Have mercy on me, O God, according to Thy great mercy..," very carefully raised the chalice cover from the face of the reposed Vladyka John. Now the most honorable face of Vladyka John was uncovered. All present felt deep devotion and total peace in their souls. No one acted surprised or expressed amazement, but with great compunction we gazed upon the incorrupt visage of the reposed Vladyka. The skin color was light, almost white. The hairs of the head and beard as well as the eyebrows were grey and preserved intact on the face. Even the eyelashes were preserved. Vladyka's mouth was slightly open and teeth were visible. The miter and inscription were preserved, though the icon of St. John the Baptist on the left side of the miter had fallen off and was lying on the pillow. A clean aer was brought to cover the face. We then commenced to uncover the lower half of the casket which was very rusted. It was necessary again to use crowbars and screwdrivers to separate it. When it was opened all present saw that the lower part of the vestments had been fully preserved. Leather sandals were visible on Vladyka's feet and it was noticed that on part of the left heel the bone was visible. As much of the feet as was visible were preserved, revealing darkly colored skin. It was decided that the relics could not remain in the old, disintegrating casket and that it would be necessary to place them in the newly prepared one. We began to sing the eirmosi of the Great Canon of Repentance of St. Andrew of Crete from the Service for the Burial of a Priest: "A helper and protector was He unto me for salvation...," "Attend, O heaven, and I will speak...," "Behold, behold, that I am God..." During the singing the holy relics were prepared for transfer to the new casket. The table with the new casket, which was next to the fresco of the Protection of the Most Holy Mother of God, was moved closer to the head of the old casket. "On the immovable rock of Thy commandments, O Christ..." was sung while the holy relics were lifted in our hands and transferred. They were lowered into the new casket during the singing of the troparion, "Have mercy on us, O Lord, have mercy on us." They were cleaned of the earth, dust and rust that had covered them. As all could see and feel, the holy relics were whole and did not fall apart. The tendons between the bones had been preserved. The relics were very light. All present saw that the vestments on the underside of the holy relics were also totally preserved. 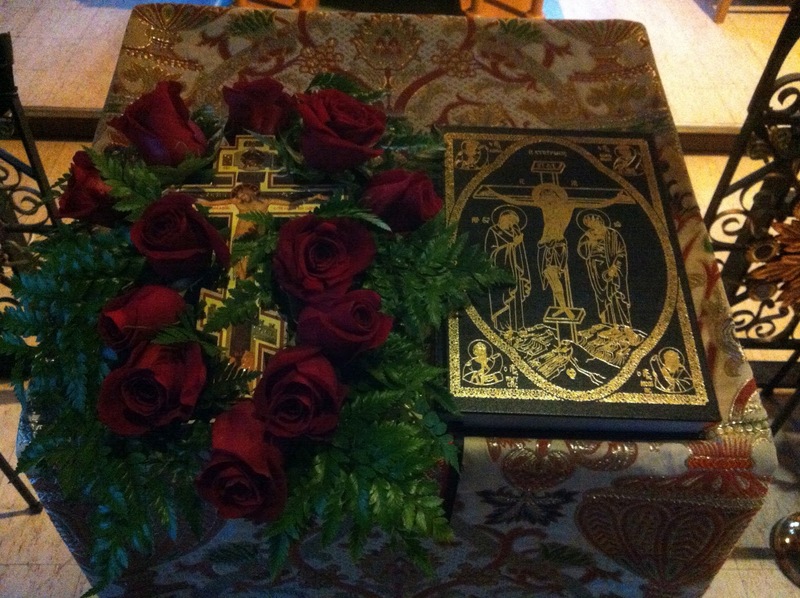 After cleaning off the dust the holy relics were placed in the new casket and wrapped in a clean sheet. During the singing of the kontakion, "My soul, my soul, arise, why steepest thou? ", the old casket was taken out of the sepulchre and placed in the neighboring room. The odor of dampness and rust disappeared and all sensed that there was no odor of corruption whatsoever around the relics. During this time the Priest Yaroslav Belikow was waiting with his two year old son not far from the sepulchre. His son Vsvelod was suffering from an illness of the kidneys and was brought into the sepulchre in order to be placed on the incorrupt hands of Vladyka John. Then all commenced to clean out the cement sarcophagus in which much rust remained. During the singing of the ninth Eirmos of the Great Canon, "A seedless conception...," the casket with the relics was placed on the cement sarcophagus. The holy objects that were in the old casket were put in an envelope and put in the new casket. Then it was lowered into the sarcophagus and the lid was placed on the casket. Vladyka Archbishop Laurus tied a cord around the casket and Vladyka Anthony sealed it with the diocesan seal and the mantle was placed on top. During the singing of "A seedless conception" the cement lid was placed back and the sarcophagus was again covered with the brocade cover. All the other objects, the icons, ripidi, trikiri, dikiri were returned to their place. After this work a litiya for the dead was served and all were anointed with oil from the ever-burning lampada on the sarcophagus. Following the example of Patriarch Paul of Serbia, all of the clergy sang the troparion to a hierarch, "Teacher of Orthodoxy," which the Patriarch has sung last year when he visited the cathedral. Vladyka Anthony then expressed his gratitude to all for their labor and zeal. Around 11:15 P.M. all began to return to their homes in an exalted, prayerful state of trepidation, sending up gratitude to the Lord God for the mercy, comfort, and spiritual joy which He had sent. Amen. Wondrous is God in His saints! Holy Father John pray to God for us! Glory, O Lord, to Thy precious Cross! We had seven visitors this evening for Vespers. Although we were not able to get a picture during the service, I did take a couple afterwards. The excellent flower arrangement around the Cross was done by The Flower Box in Peoria Heights - on short notice as well. It is a beautiful addition to the service. The Most Holy Virgin Mary was born at a time, when people had reached such limits of decay of moral values, that it seemed altogether impossible to restore them. The best minds of this era were aware and often said openly, that God mustneeds come down into the world, so as to restore faith and not tolerate the ruination of the race of mankind. The Son of God chose for the salvation of mankind to take on human nature, and the All-Pure Virgin Mary, – alone worthy to contain in Herself and to incarnate the Source of purity and holiness, – He chose as His Mother. The Birth of Our Most Holy Lady Mother of God and Ever Virgin Mary is celebrated by the Church as a day of universal joy. Within the context of the Old and the New Testaments, on this radiant day was born the Most Blessed Virgin Mary, – having been forechosen through the ages by Divine Providence to bring about the Mystery of the Incarnation of the Word of God, and She is revealed as the Mother of the Saviour of the World, Our Lord Jesus Christ. The Most Holy Virgin Mary was born in the small city of Galilee, Nazareth. Her parents were Righteous Joakim from the tribe of the King and Prophet David, and Anna from the tribe of the First-Priest Aaron. The couple was without child, since Saint Anna was barren. Having reached old age, Joakim and Anna did not lose hope on the mercy of God. They had strong faith that for God everything is possible, and that He would be able to solve the barrenness of Anna – even in her old age, as He had once solved the barrenness of Sarah, spouse of the Patriarch Abraham. Saints Joakim and Anna made a vow to dedicate the child which the Lord might bestow on them, into the service of God in the Temple. Childlessness was considered among the Hebrew nation as a Divine punishment for sin, and therefore the righteous Saints Joakim and Anna had to endure abuse from their own countrymen. On one of the feastdays at the Temple in Jerusalem the elderly Joakim brought his sacrifice in offering to God, but the High Priest would not accept it, – considering him to be unworthy since he was childless. 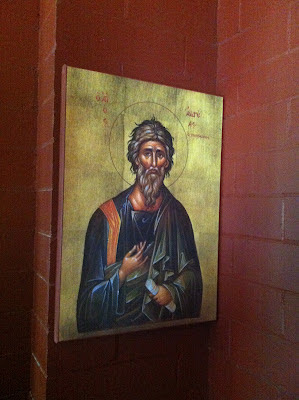 Saint Joakim in deep grief went into the wilderness and there he prayed with tears to the Lord for the granting of a child. Saint Anna, having learned about what had happened at the Jerusalem Temple, wept bitterly; never once did she complain against the Lord, but rather she prayed, asking God's mercy on her family. The Lord fulfilled her petitions when the pious spouses had attained to extreme old age and prepared themselves by virtuous life for a sublime calling – to be the parents of the Most Holy Virgin Mary, the future Mother of the Lord Jesus Christ. The Archangel Gabriel brought Joakim and Anna the joyous message: their prayers were heard by God, and of them would be born a Most Blessed Daughter Mary, through Whom would come the Salvation of all the World. The Most Holy Virgin Mary of Herself in purity and virtue surpassed not only all mankind but also the Angels; – She was manifest as the Living Temple of God, such that the Church sings in its festal verses of song: "the Heavenly Gate, bringing Christ into the world for the salvation of our souls" (2nd Stikhera on "Lord, I have cried", Tone 6). The Birth of the Mother of God marks the change of the times, wherein the great and comforting promises of God begin to be fulfilled about the salvation of the human race from slavery to the devil. This event has brought nigh to earth the grace of the Kingdom of God, – a Kingdom of Truth, piety, virtue and life immortal. Our Mother FirstBorn of All Creation is revealed to all of us by grace as a merciful Intercessor and Mother, to Whom we steadfastly recourse with filial devotion. Today, September 1st (Julian calendar), the Orthodox Church has officially recognized as the beginning of the new year since the First Ecumenical Council in the 4th century. On this day, when the Jews celebrated the new summer, the Savior, came to Nazareth where He was brought up and entered the synagogue on the Sabbath day as was His custom, and read these words of the Prophet Isaiah: "The Spirit of the Lord is upon me because he has anointed Me ... to proclaim the acceptable year of the Lord" (Luke 4, 18:19). On the first of September 312 the Emperor Constantine the Great won a victory over Maxentius. After this Christians were granted complete freedom to confess their faith. In commemoration of these two events the fathers of the First Ecumenical Council decided to begin the New Year on the first of September (See January 1, March 1 and the Paschalia). In its hymns for this day the Holy Church prays "Creator and Fashioner of all things visible and invisible" "bless the crown of the year", "grant fruitful seasons and rains from heaven for those on earth", "bless our comings and goings, direct the works of our hands and grant us forgiveness of offences", "grant peace to Thy churches", "overthrow heresies", "protect our cities unbesieged, make glad our faithful Sovereigns by Thy power, giving them victories against enemies". 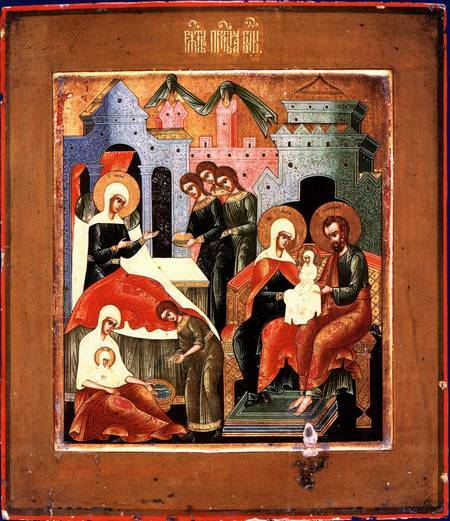 The First Ecumenical Council [Nicaea, 325] decreed that the Church year should begin on September 1. The month of September was, for the Hebrews, the beginning of the civil year (Exodus 23:16), the month of gathering the harvest and of the offering of thanks to God. It was on this feast that the Lord Jesus entered the synagogue in Nazareth (Luke 4:16-21), opened the book of the Prophet Isaiah and read the words: The Spirit of the Lord God is upon Me; because the Lord hath anointed Me to preach good tidings unto the meek; He hath sent Me to bind up the brokenhearted, to proclaim liberty to the captives, and the opening of the prison to them that are bound; to proclaim the acceptable year of the Lord, and the day of vengeance of our God; to comfort all that mourn (Isaiah 61:1-2). The month of September is also important in the history of Christianity, because Emperor Constantine the Great was victorious over Maxentius, the enemy of the Christian Faith, in September. Following this victory, Constantine granted freedom of confession to the Christian Faith throughout the Roman Empire. For a long time, the civil year in the Christian world followed the Church year, with its beginning on September 1. The civil year was later changed, and its beginning transferred to January 1. This occurred first in Western Europe, and later in Russia, under Peter the Great. The Logos-the rational, intelligent Word-existed in the beginning. This pertains to the Divine Nature of our Lord Jesus Christ. 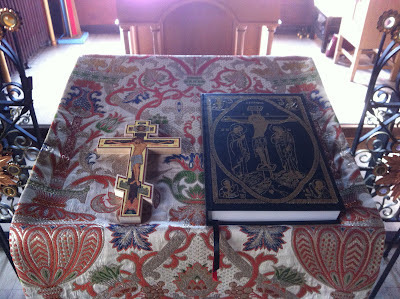 Brethren, by saying, In the beginning, do we think that the Word of God has a beginning? Or that there was a certain date in time when the Son of God was born of God the Father? In no way! For the birth of the Son of God can have neither a date nor a beginning, since time is a condition of this transient world, and it does not affect the eternal God, and therefore does not affect anything at all that is of God. Can the sun remain the sun, if the sunlight is separated from it? Will a man remain a man, if his mind is taken away? Would honey still be honey, if its sweetness is separated from it? It cannot. Even less can one conceive of God as separate from His Logos, from His rational Word, from His Intelligence, from His Wisdom-the eternal Father separate from His co-eternal Son. No, brethren, the words are not about the beginning of the Son of God from God the Father, but rather about the beginning of the history of the created world and the salvation of mankind. This beginning is in the Word of God, in the Son of God. He began both the creation of the world and the salvation of the world. Whoever would speak of the creation of the visible or invisible worlds, or of the salvation of mankind, must begin with the Beginning. And that Beginning is the Word of God, the Wisdom of God, the Son of God. For example, if someone were telling a story about boating on a lake, he might begin it like this: ``In the beginning there was a lake, and on it sailed a white boat….'' No reasonable person would interpret the words, ``In the beginning there was a lake…'' to mean that the lake came into existence on the same day that the boat sailed on it. Thus, no rational man could take the words of the Evangelist, In the beginning was the Word…, as though the Word of God came forth from God at the same moment that the world was created! Just as the lake existed for thousands of years before the boat sailed on it, so the Word of God existed for a whole eternity before the beginning of creation. O Son of God, co-eternal with the Father and the Spirit, enlighten us and save us. May we receive a full measure of joy in Christ through the prayers of our father among the saints, the Holy Glorious Prophet, Forerunner and Baptist, John. Earlier on Saturday we had the privilege to welcome Vasiliki into the Orthodox Church who had just been received by Holy Chrismation by Father John Sardis at All Saints Greek Orthodox Church in Peoria. Many years to you, Vasiliki! 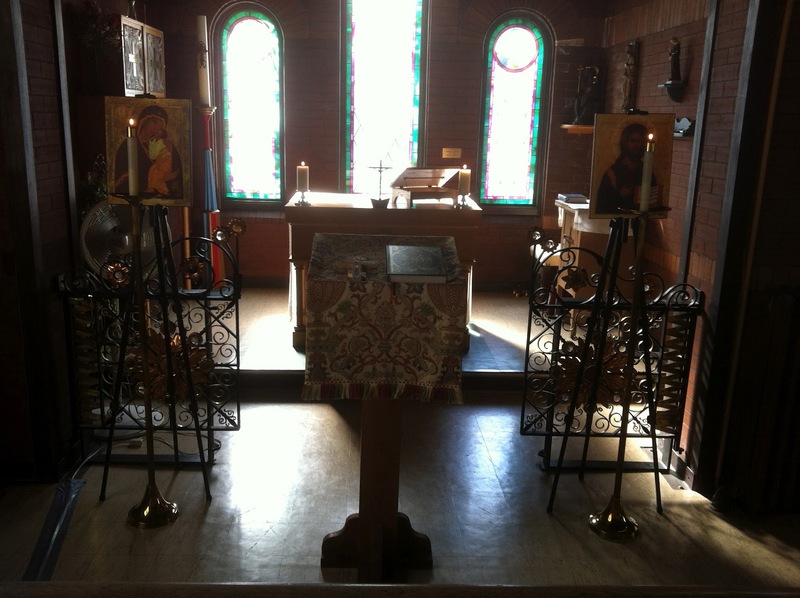 On Sunday, I was blessed to serve at Holy Apostles Orthodox Mission (OCA) in Normal, IL with Fr. John Brown and Subdeacon David and to receive the Holy Mysteries. It was my first visit there, and I am glad to have been among this pleasant and diverse community. 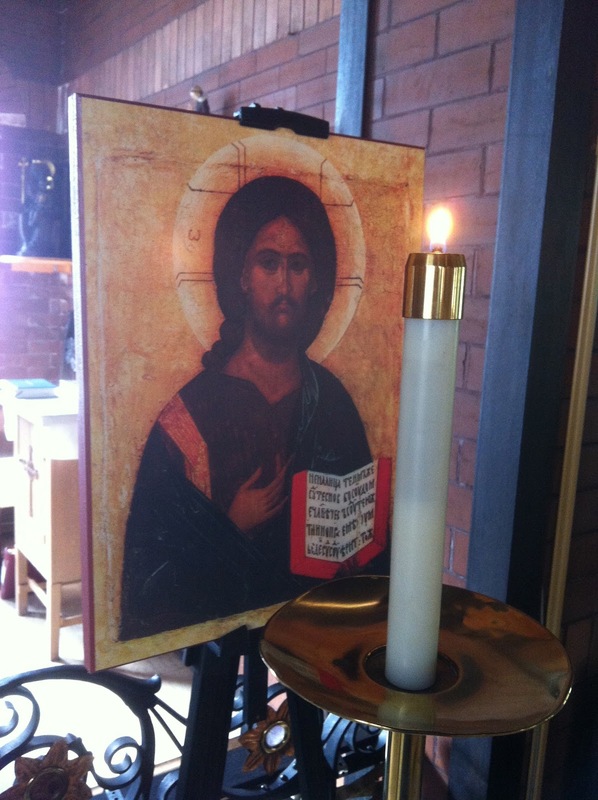 We at Holy Transfiguration Mission will continue services this evening celebrating the blessed Feast of the Beheading of the Holy Glorious Prophet, Forerunner, and Baptist John with readers Vespers at 5:30 and tomorrow morning with the Hours and Typika at 8:30. We also have scheduled weekly Vespers celebrations of the Resurrection at 4:30, along with evening and morning services for the blessed Feasts of the Nativity of the Mother of God, and the Elevation of the Life-Giving Cross on the appropriate dates this month. For the near future, on Sundays we plan to make pilgrimage to our sister communities in the area to serve, receive the Holy Mysteries, and enjoy the fellowship of our brothers and sisters in Christ. 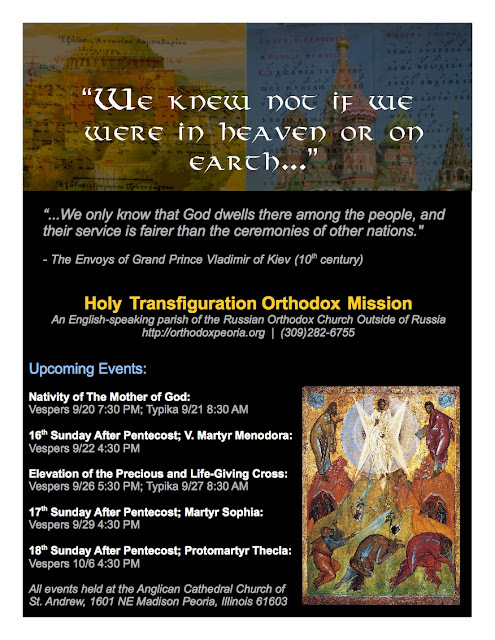 This next Sunday we plan to celebrate again with St. Elias Antiochian Orthodox Church in Peoria. Please keep an eye on the calendar at the bottom of our page. If there are any significant schedule changes we will also post a special update. The Monk Moses Murin the Black lived during the IV Century in Egypt. He was an Ethiopian, and he was black of skin and therefore called "Murin" (meaning "like an Ethiopian"). In his youth he was the slave of an important man, but after he committed a murder, his master banished him, and he joined in with a band of robbers. Because of his mean streak and great physical strength they chose him as their leader. Moses with his band of brigands did many an evil deed – both murders and robberies, so much so that people were afraid even at the mere mention of his name. Moses the brigand spent several years leading suchlike a sinful life, but through the great mercy of God he repented, leaving his band of robbers and going off to one of the wilderness monasteries. And here for a long time he wept, beseeching that they admit him amidst the number of the brethren. The monks were not convinced of the sincerity of his repentance; but the former robber was not to be driven away nor silenced, in demanding that they should accept him. In the monastery the Monk Moses was completely obedient to the hegumen and the brethren, and he poured forth many a tear, bewailing his sinful life. After a certain while the Monk Moses withdrew to a solitary cell, where he spent the time in prayer and the strictest of fasting in a very austere lifestyle. One time 4 of the robbers of his former band descended upon the cell of the Monk Moses and he, not having lost his great physical strength, he tied them all up and taking them over his shoulder, he brought them to the monastery, where he asked of the elders what to do with them. The elders ordered that they be set free. The robbers, learning that they had chanced upon their former ringleader, and that he had dealt kindly with them, – they themselves followed his example: they repented and became monks. And later, when the rest of the band of robbers heard about the repentance of the Monk Moses, then they too gave up their brigandage and became fervent monks. Accounts about his exploits spread amongst the monks and even beyond the bounds of the wilderness. The governor of the land wanted to see the saint. Having learned about this, the Monk Moses decided to hide away from any visitors and he departed his own cell. Along the way he met up with servants of the governor, who asked him, how to get to the cell of the wilderness-dweller Moses. The monk answered them: "Go on no further to this false and unworthy monk". The servants returned to the monastery, where the governor was waiting, and they conveyed to him the words of the elder they had chanced upon. The brethren, hearing a description of the elder's appearance, all as one acknowledged that they had come upon the Monk Moses himself. Having spent many a year at monastic exploits, the Monk Moses was ordained deacon. The bishop attired him in white vesture and said: "Abba Moses is now entirely white". The saint answered: "Vladyka, what makes it purely white – the outer or the inner?" Through humility the saint reckoned himself unworthy to accept the dignity of deacon. One time the bishop decided to test him and he bid the clergy to drive him out of the altar, whilst reviling him for being an unworthy black-Ethiopian. With full humility the monk accepted the abuse. Having put him to the test, the bishop then ordained the monk to be presbyter. And in this dignity the Monk Moses asceticised for 15 years and gathered round himself 75 disciples. When the monk reached age 75, he forewarned his monks, that soon brigands would descend upon the skete and murder all that were there. The saint blessed his monks to leave in good time, so as to avoid the violent death, His disciples began to beseech the monk to leave together with them, but he replied: "I many a year already have awaited the time, when upon me there should be fulfilled the words which my Master, the Lord Jesus Christ, did speak: "All, who take up the sword, shalt perish by the sword" (Mt. 26: 52). After this seven of the brethren remained with the monk, and one of these hid not far off during the coming of the robbers, The robbers killed the Monk Moses and the six monks that remained with him. Their death occurred in about the year 400. 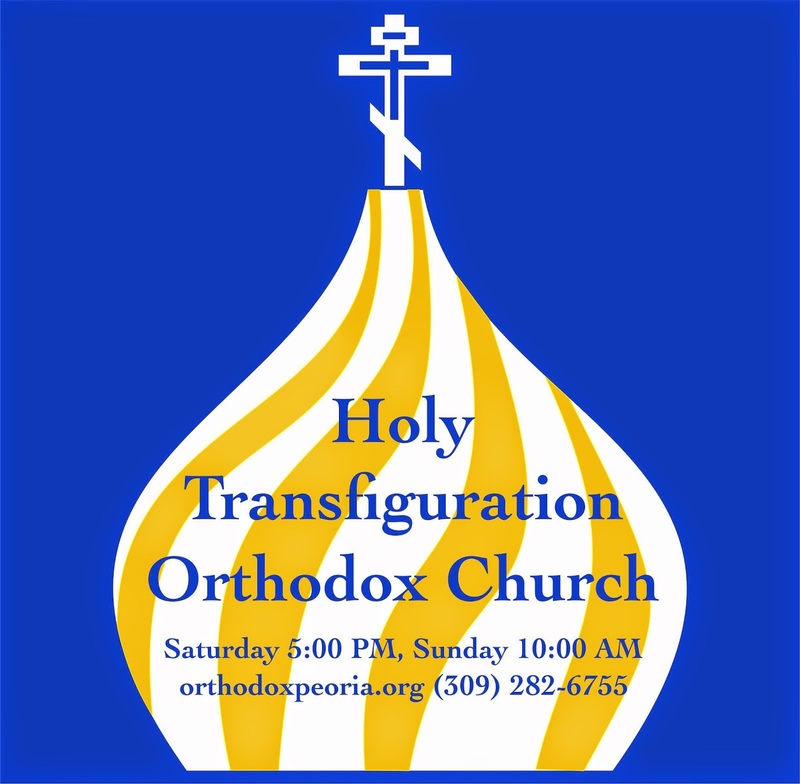 On September 2, 2012 (civil), the 13th Sunday after Pentecost, afterfeast of the Dormition of the Mother of God, and the feast of the Holy Prophet Samuel, Robin, Lexi, and I attended Divine Liturgy at Holy Protection Orthodox Church in Overland Park, Kansas. Father Zachary blessed me to serve, where we also witnessed the joyous presence of our Savior and partook of His Holy Mysteries. Thank you Father Zachary and the community of Holy Protection Church for your service to God and your warm hospitality! “Christ’s call is still reaching to us; let us begin to listen to it.” These words of Father Serpahim (Rose)—ascetic, theologian, and preacher—are relevant today more than ever. His books helped many to hear this call. Written in the 1970s and ‘80s for his contemporaries lost in the intellectual wastelands, his works are today even more relevant, because today’s “intellectuals” are wandering lost in even more dangerous deserts of spiritual morbidity. Fr. Seraphim in the St. Elias Skete, Noble Ridge, near the St. Herman of Alaska Monastery in Platina, Cal. In the background is Mt. St. Herman. 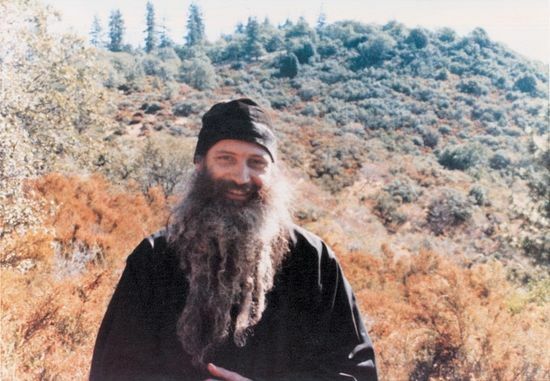 Father Seraphim departed to the Lord on September 2, 1982—30 years ago. In honor of this day, Pravoslavie.ru has asked several pastors of the Russian Orthodox Church to talk about what Father Seraphim means to them.